Kootenay National Park is a national park located in southeastern British Columbia, Canada, and is one component of the Canadian Rocky Mountain Parks World Heritage Site. The park consists of 1,406 km2 (543 sq mi) of the Canadian Rockies, including parts of the Kootenay and Park mountain ranges, the Kootenay River and the entirety of the Vermilion River. While the Vermillion River is completely contained within the park, the Kootenay River has its headwaters just outside the park boundary, flowing through the park into the Rocky Mountain Trench, eventually joining the Columbia River. It ranges in elevation from 918 m (3,012 ft) at the southwestern park entrance, to 3,424 m (11,234 ft) at Deltaform Mountain. Initially called "Kootenay Dominion Park", the park was created in 1920 as part of an agreement between the province of British Columbia and the Canadian federal government to build a highway in exchange for title to a strip of land, approximately 8 km (5.0 mi) on either side of the 94 km route, the Banff-Windermere Highway, to be used solely for park purposes. While the park is open all year, the major tourist season lasts from June to September. Most campgrounds are open from early May to late September, while limited winter camping is available only at the Dolly Varden campground. The Kootenay National Park is one of seven contiguous parks that form the Canadian Rocky Mountain Parks World Heritage Site. The Continental Divide is the boundary between the Kootenay and Banff National Park boundary, as well as the BC-Alberta provincial border. To the northwest, the watershed boundary between the Vermillion River and the Kicking Horse River is the park boundary between the Kootenay and Yoho National Park. The Mount Assiniboine Provincial Park also borders the Kootenay National Park. Jasper National Park, Mount Robson Provincial Park and Hamber Provincial Park make up the remainder of the World Heritage Site but do not share a boundary with Kootenay National Park. Archaeological evidence suggests humans have been either traveling through, or temporarily residing in, the area for about 10,000 years. Pictographs found in the hot spring caves indicate that it was the Ktunaxa people who first made more permanent use of the area, particularly the hot springs, several hundred years ago. European fur traders and trappers passed through, as did George Simpson in 1841, through what would later be named Simpson Pass, during his circumnavigation of the world. Likewise, James Sinclair led Red River colonists westward and Pierre-Jean De Smet traveled eastward, through the area. 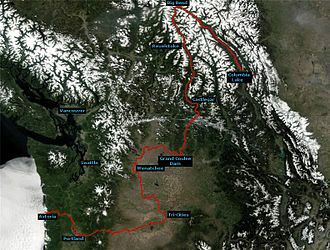 The Palliser expedition used the Vermilion Pass in 1858 and reported to British government its potential as a transportation route. On the Columbia River side, an early homesteader included the hot spring that would later become Radium Hot Springs in his land claim in the 1880s, but it was Roland Stuart and his business partner H.A. Pearse who were successful in acquiring the 160 acres around the springs in 1890 as a provincial crown grant. 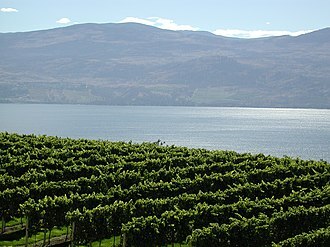 While they intended on bottling the spring water, its remote location prevented such development and Stuart offered to sell the property in 1909 to the Canadian Pacific Railway Company for $3000. Though the offer was not accepted, railway engineer Robert Randolph Bruce recognized the potential for a road through the area and advocated for it in 1910 with CPR president Thomas Shaughnessy and Premier Richard McBride, as a commercial link for the province to Calgary and eastern Canada. The federal government agreed to build a road from Banff to the park boundary at the provincial border at the Vermilion Pass, while the provincial government, with some funds from the CPR, would build a road from Windermere to the border. However, the BC government under-estimated its cost, found itself over-budget and its work was suspended in 1913, while the federal government completed their portion in November 1914. To get the British Columbia section completed, Bruce traveled to Ottawa to pitch the idea that they designate the western end of the route, through the Rockies Mountains, a national park so that road could be funded as a park improvement. With the popularity of Banff National Park made the Commissioner of the Parks Branch, James Bernard Harkin, and officials of the Minister of Interior were receptive to expanding the park system there. In May 1916 Minister William James Roche began negotiations, and the subsequent Minister of the Interior agreed with the provincial counterparts to the Banff-Windermere Agreement, that the federal government would complete the road within 4 years of the end of war, and maintain it thereafter, in exchange for the agreed upon land to be used for park purposes and a resolution to jurisdictional matters in the other federal parks in BC. 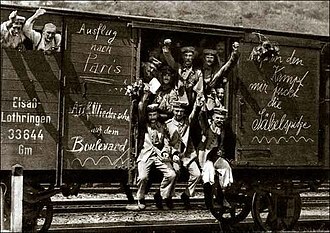 The agreement was signed on March 12, 1919, and the federal government took ownership of the land in July 1919. By Order in Council 1920-0827 on April 21, 1920, the Kootenay National Park was created. The federal government repaired the provincial portion and completed the remainder, completed for public opening by June 1923. The park's main attractions include Radium Hot Springs, the Paint Pots, Sinclair Canyon, Marble Canyon, and Olive Lake. The hot springs offer a hot springs pool ranging from 35 to 47 °C (95 to 117 °F). Just outside the park's southwestern entrance is the town of Radium Hot Springs. The town is named for the odourless hot springs located just inside the park boundary. The park's northeastern entrance, connects to Castle Junction in Banff National Park and the Trans-Canada Highway via Vermillion Pass, a mountain pass across the Continental Divide of the Canadian Rockies on the Alberta/British Columbia border, at an elevation of 1,651 metres (5,416'). Development of the hot springs began in earnest after a British medical journal suggested, and a 1914 chemical analysis by McGill University confirmed, the presence of radium within the water. Roland Stuart, who had acquired the springs through a 160-acre crown grant, purchased an additional 455 acres in the vicinity of the springs as the area became accessible by the Kootenay Central Railway. Stuart traveled to England promoting the "Kootenay Radium Natural Springs Limited" and recruited the paralysed St John Harmsworth to visit. After a four-month stay he invested enough to build a bathing pool with a store and a caretaker's cottage. With the park becoming a reality, the Dominion government offered, in 1921, Stuart $20,000 for control of the springs. 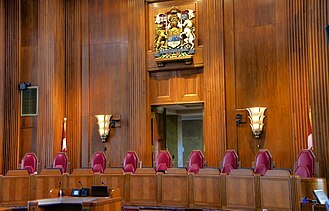 With his agent unable to reach him, or Stuart ignoring the offer, the government expropriated the land, in 1922, with a settlement, after numerous hearings right up to the Supreme Court, of $40,000 in 1927. In that same year, a new two-storey bath-house was erected and the pool lengthened by 30 feet. Meanwhile, the town of Radium Hot Springs was being developed after the 1923 subdivision to create commercial properties and the Canadian Pacific Railway Company developed cabins the area that would later become the Radium Hot Springs Lodge. The facility was re-built after a fire in 1948 at the cost of $1,000,000 with a concrete pool and other facilities. Major renovations and improvements between 1960 and 1968 added additional capacity, a restaurant, and a campground (at the Redstreak Campground), as well as buying out the CPR cabin properties. Another round of renovations occurred in 1997 with a new hot-cold plunge pool being added. The Paint Pots are an acidic, cold water, mineral spring system from which ochre is deposited at spring outlets. 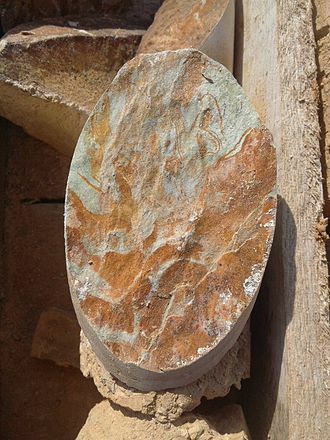 The minerals are principally iron oxide which produces the water and mud's reddish colour but other similar minerals can also be present and vary the colours to include various shades of yellow, red and brown. The acidic, metal-rich water has limited capacity to support living species, but at least 14 species of algae, one liverwort and one moss species, as well as some extremophilic bacteria, have been identified living in those waters. The ochre was collected by the Ktunaxa people for use as pigments and the iron oxide was commercially mined for use in paint manufacturing for nearly two decades until the park was established in 1920. Because of the relatively small width of the park (five miles on each side of the highway), many of the park's attractions are situated near the road and are wheelchair accessible. A number of recent forest fires in the northern half of the park in the Simpson River, Vermillion Pass, and Floe Creek areas in 2003 and 2004 have left significant burn areas readily visible from the highway. Numa Falls is a short drive south of Marble Canyon and is accessible directly by Highway 93 which cuts through the park. The Rockwall trail is a multi-day hike along the limestone cliff eastern escarpment of the Vermilion Range that continues into the Yoho National Park. There are several connections to the trail from the highway, including the 10.7 km Floe Creek trail to Floe Lake campground and the 6 km Numa Creek trail to the Numa Falls campground. There is another trailhead at the Paint Pots that follows Ochre Creek with forks to the 7 km Tumbling Creek trail and the 9 km Helmet Creek trail, both of which have campground. Beyond Helmut Falls the Rockwall trail continues through Goodsir Pass into the Yoho National Park. Other multi-day backcountry hikes include the Tokumun Creek trail to Fay Hut and Neil Colgan Hut, the Simpson River trail into the Mount Assiniboine Park, the Hawk Creek trail through Ball Pass into the Banff National Park, the Verdant trail from the Vermillion crossing to Banff National Park via the Honeymoon Pass and the Redearth Pass. Day hikes with nearby campgrounds include trails on Redstreak Mountain and along Redstreak Creek, the Dog Lake trail from the McLeod Meadows campground, and the Marble Canyon to Paint Pots trail from the Marble Canyon campground. Other dayhikes, of various difficulty levels, include trails to Olive Lake, to Cobb Lake, the Kindersley/Sinclair loop, the Tokumun Creek trail from Marble Canyon to Kaufmann Lake, the Kimpton Creek trail, the Hector Gorge trail, the Verendrye Creek from the Vermillion Crossing, and the Stanley Creek trail. The Dolly Varden trail along the Dolly Varden Creek (the fish was later identified as bull trout, not Dolly Varden trout) permits cycling and has a campground open when the McLeod Meadows campground closes (e.g. available for winter camping). The park is centered around the 94 km stretch of the Highway 93, from Radium Hot Springs to the provincial border at the Vermillion Pass. The park's size and shape are the result of the federal-provincial agreement to get the road constructed. Consequently, despite the northwest-southeast trending range and valley systems, the park cuts through several mountain ranges and river valleys. 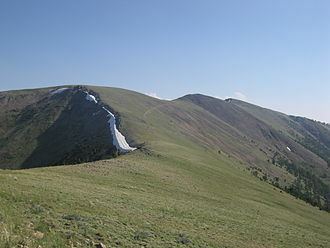 The park's southwestern entrance, near Radium Hot Springs and the Sinclair Canyon, is the only part of the park within Southern Rocky Mountain Trench. As the highway follows Sinclair Creek, which drains westward towards the Columbia River, the park enters the Kootenay Ranges, which include Mount Berland and the western and southern faces of Mount Kindersley of the Brisco Range and Redstreak Mountain and Mount Sinclair of the Stanford Range. The eastern side of Mount Sinclair faces the valley of the Kootenay River; that and the remainder of the park drains to the Kootenay River which does eventually empty into the Columbia River but not until well outside the park and crossing the American-Canadian border twice. The park then covers a ~27 km stretch of the Kootenay River valley including the flanking mountain faces of Mount Kindersley and the Mitchell Range and Vermillion Range of the western portion of the Park Ranges. At the bridge over Kootenay River, the road and park divert northward to follow the Vermillion River upstream through the pass between Mount Wardle of the Vermillion Range and Spar Mountain of the Mitchell Range. As the park bends northward here, it expands to include more of the Kootenay River valley, including Dolly Varden Creek, Lost Creek, and Whitetail Creek. With the Mount Assiniboine Park just over the mountains to the southeast, the road and park divert northwestward again once into the valley of the Vermillion River, near where it converges with the Simpson River. After this, the park consists of the remainder of the Vermillion River drainage basin, with the Banff National Park at the Continental Divide to the north at the Ball Range and the Bow Range, the Yoho National Park to the northwest, and the peaks of the Vermillion Range to the southwest. A small portion of the Ottertail River, which drains into the Yoho National Park, is also included the northwestern end of the park, though the remainder of that border is the dividing line between the Vermillion River and the Kicking Horse River. There are only a few, small lakes in the park, most of which occur in the Vermillion River drainage basin and occur at high altitude in cirques or hanging valleys, which is typical for the Main Ranges. The Floe, Kaufmann and Talc lakes occur here, while the Dog, Olive and Cobb lakes occur in the Kootenay River basin and have more pond-like characteristics such as shallow depth and slower flow. The geology of the park is dominated by mountains made up of exposed faulted sedimentary rock and valleys containing glacial till deposited in the Pleistocene. Just outside the northwestern corner of the park, there is an igneous intrusion known as the Ice River Complex containing deposits of sodalite, an ornamental stone. 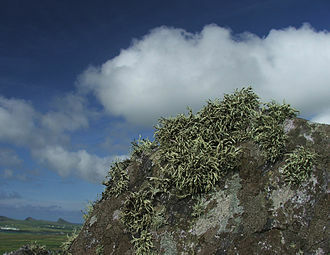 The hills immediately around the hot springs are composed mainly of tufa, a calcium carbonate deposit that forms by precipitation of supersaturated hot spring water when it reaches cooler surface water. 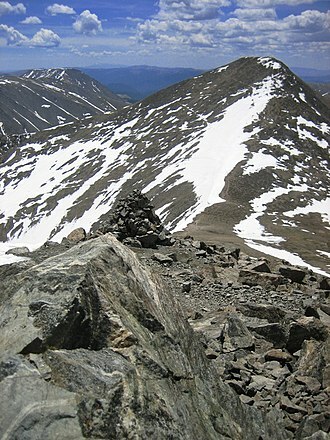 The rocks in southwestern corner of the park are part of the older Purcell Mountains range while the eastern park mountains are part of the younger Rocky Mountains range. The park has many Cambrian strata of oceanic sedimentary origin that shed insight into the explosive radiation of multicellular life on Earth. In the summer of 2012 a team of scientists from the Royal Ontario Museum, Pomona College, the University of Toronto, the University of Saskatchewan and Uppsala University discovered a Lagerstätte site of extraordinary preservation in shale, comparable to the Burgess Shale's phyllopod bed of fossils. only 42 kilometres (26 mi) distant, in Yoho National Park. One species Kootenichela discovered in these rocks had been scientifically described: more than 50 new species were discovered in the Marble Canyon area in just two weeks of intensive exploration. The new assemblage of organisms, dating to the Wuliuan, such as the Surusicaris elegans, is described as rich in basal arthropods and remarkable for the density and diversity of its soft-bodied organisms, some preserved in previously unreported detail. The park experiences a continental macroclimate which is characterized by brief, cool summers and long snowy winters, but is generally drier than the areas to the west due to the Kootenay Ranges capturing moisture. Similarly, the park's mountain ranges intercept moisture that would otherwise fall on the other side of the Continental Divide, making the Banff National Park drier. Combined with the Continental Divide protecting it from the brunt of the arctic air flow, the park experiences a more mild climate than Banff. Based on the climate and geography, the park has been divided into different ecoregions: Montane, Subalpine and Alpine, which consequently affect vegetation and wildlife. The Montane ecoregions are at lower elevations, such as at the park's west gate and the valley of the Kootenay River, and experience between 300 and 600 mm of precipitation each year, 30 to 45% of which falls as snow. The subalpine ecoregion, such as the valley of the Vermillion River and at Floe Lake and Marble Canyon, experience cooler and moister weather, with mean annual temperatures less than 1 degrees Celcuis and about 800 mm of precipitation, over half of which is snow. The alpine ecoregion, at the park's highest elevations, is even colder and snowier, which results in a lack of forest cover. The Montane Spruce biogeoclimatic zone of the park's lower elevations contain forests of mostly Douglas fir, lodgepole pine, western larch, trembling poplar, and western redcedar. The shrub layer mostly include soapberry, kinnikinnick, western showy aster, dwarf bilberry, twinflower, pinegrass, Canadian bunchberry, littleleaf huckleberry, Rocky Mountain maple, alder, mountain huckleberry, oval-leaf blueberry, meadow horsetail, Devil's club, as well as common and rocky mountain juniper. In the higher subalpine elevations, the Engelmann Spruce-Subalpine Fir biogeoclimatic zone takes over with its dominant tree species of Engelmann spruce, white spruce, subalpine fir and subalpine larch, begin to take over at higher elevations. Heathers, arctic willow, cinquefoils, moss campion, and mountain avens are the dominant vegetation in the alpine areas. Forest fires that affected the park, exemplified by the large fires of 1968 and 2017 and the very large fire of 2003 in the Vermillion area, feature pioneering vegetation like fireweed and lodgepole pine. An emerging drier climate, and forest fires, are resulting in the Interior Douglas-fir biogeoclimatic zone expanding into the park, with its more dominant Douglas fir, ponderosa pine and rocky mountain juniper tree stands. A wildlife survey found 242 species of mammals, birds, amphibians and reptiles. The largest species are the ungulates, such as the bighorn sheep, mountain goat, moose, red deer, white-tailed deer, mule deer, though there are also black bears and grizzly bears that also live in the park. Coyotes and martens are the only widespread and common carnivores in the park, though bobcats and cougars live in the southern regions. Timber wolves, lynxes, wolverines, minks, fishers, badgers, river otters, skunks and long and short-tailed weasels have also been identified but are not common. The most common non-carnivoruos mammal species living in the park are the snowshoe hare, red-backed vole, deer mouse, red squirrel and Columbian ground squirrel. Most bird species only use the park as their summer grounds or part of their migration route; only 32 species live solely in the park. Some of the most common birds include the boreal owl, yellow-rumped warbler, golden-crowned kinglet, common yellowthroat, American robin, spotted sandpiper, chipping sparrow, two-barred crossbill, rufous hummingbird, water pipit. Other bird species that may be observed include the common loon, grey and Steller's jays, Canada and snow geese, Trumpeter and Tundra swans. The three reptiles identified were the rubber boa, common garter snake and western terrestrial garter snake. In 1984, UNESCO added the Canadian Rocky Mountain Parks World Heritage Site, to the World Heritage List. This World Heritage Site included the four contiguous national parks: Kootenay, Banff, Jasper and Yoho. At the time, the site was deemed to meet [[World Heritage Site}criteri#Selection criteria|the natural criteria]] for examples of geological processes, record of life, and for exceptional natural beauty. 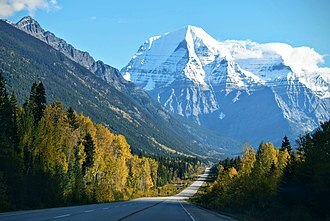 In 1990, the Mount Assiniboine, Mount Robson and Hamber Provincial Parks were added to the World Heritage Site, bringing its total area up to 22,991 km2 (8,877 sq mi). 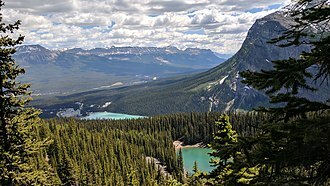 Under their Statement of Significance, UNESCO states "With rugged mountain peaks, icefields and glaciers, alpine meadows, lakes, waterfalls, extensive karst cave systems and deeply incised canyons, the Canadian Rocky Mountain Parks possess exceptional natural beauty, attracting millions of visitors annually." Trail markers, taken from the plateau just below Stanley Glacier, facing Mt Whymper. ^ Lothian, W.F. (1976). A History of Canada's National Parks. I. Parks Canada. pp. 58–61. ^ Hahn, Bob (2000). Kootenay National Park. Rocky Mountain Books. pp. 14–15. ISBN 0921102747. ^ Grasby, Stephen E.; Richards, Barry C.; Sharp, Christine E.; Brady, Allyson L.; Jones, Gareth M.; Dunfield, Peter F. (2013). "The Paint Pots, Kootenay National Park, Canada — a natural acid spring analogue for Mars". Canadian Journal of Earth Sciences. 50 (1): 94–108. ^ a b Hahn, Bob (2000). Kootenay National Park. Rocky Mountain Books. pp. 35–100. ISBN 0921102747. ^ B.D. Walker, D.T . Allan and W.S. Taylor (1984). Ecological Land Classification of Kootenay National Park, British Columbia. I: Integrated Resource Description. University of Alberta. pp. 1–6. ^ Caron, Jean-Bernard; Gaines, Robert R.; Aria, Cédric; Mángano, M. Gabriela; Streng, Michael (11 February 2014). "A new phyllopod bed-like assemblage from the Burgess Shale of the Canadian Rockies". Nature Communications. 5: 3210. doi:10.1038/ncomms4210. PMID 24513643. Retrieved 12 February 2014. ^ Schmidt, Colleen (11 February 2014). "Scientists unearth epic fossil find in Kootenay National Park". Calgary, Alberta: CTV News. Retrieved 1 June 2014. ^ Aria, Cédric; Caron, Jean-Bernard (June 2015). "Cephalic and Limb Anatomy of a New Isoxyid from the Burgess Shale and the Role of "Stem Bivalved Arthropods" in the Disparity of the Frontalmost Appendage". PLoS ONE. 10 (6): 1–37. ^ Anthony, Leslie (February 2017). "Shale Game". Canadian Geographic. 137 (1): 50–55. ^ a b B.D. Walker and P.L. Achuff (1984). "Climate". Ecological Land Classification of Kootenay National Park, British Columbia. I: Integrated Resource Description. University of Alberta. pp. 6–11. ^ P.L. Achuff and H.A. Dudynsky (1984). "Vegetation". Ecological Land Classification of Kootenay National Park, British Columbia. I: Integrated Resource Description. University of Alberta. pp. 43–132. ^ Derworiz, Colette (2 August 2013). "2003 fires lead to positive environmental changes:Kootenay blazes wreaked havoc 10 years ago". Calgary Herald. Retrieved 4 August 2013. ^ Hallett, Douglas J.; Walker, Robert C. (2000). "Paleoecology and its application to fire and vegetation management in Kootenay National Park, British Columbia". Journal of Paleolimnology (24): 401–414. ^ D.M. Poll and M.M. Porter (1984). "Wildlife". Ecological Land Classification of Kootenay National Park, British Columbia. I: Integrated Resource Description. University of Alberta. pp. 133–158, 323–327. ^ "Canadian Rocky Mountain Parks". UNESCO World Heritage Centre. Retrieved March 13, 2018. Wikimedia Commons has media related to Kootenay National Park. A campsite or camping pitch is a place used for overnight stay in the outdoors. In American English the term campsite generally means an area where an individual, group, or military unit can pitch a tent or park a camper, there are two types of campsites, an impromptu area a dedicated area with improvements and various facilities. The term camp comes from the Latin word campus, meaning field, therefore, a campgrounds consists typically of open pieces of ground where a camper can pitch a tent or park a camper. More specifically a campsite is an area set aside for camping. Campsites typically feature a few improvements, dedicated campsites, known as Campgrounds, usually have some amenities. Common amenities include, listed roughly in order from most to least common and it is thought to be a nuisance, harmful to the environment, and is often associated with vagrancy. However some countries have specific laws and/or regulations allowing camping on public lands, in the United States, many national and state parks have dedicated campsites and sometimes allow impromptu backcountry camping by visitors. U. S.
National Forests often have established campsites, but generally allow camping anywhere, in Britain, it is more commonly known as wild camping, and is mostly illegal. However, Scotland has a view and wild camping is legal in the majority of Scotland. In many parts of Canada, roughing it is considered to be camping on government owned, public land known as crown land. In North America many campgrounds have facilities for Recreational Vehicles and are known as RV parks. Similar facilities in the UK are known as Caravan Parks, the Kampgrounds of America is a large chain of commercial campgrounds located throughout the United States and Canada. Many travellers prefer to use KOA, or similar campsites, as an alternative to hotels or motels. Both commercial and governmental campgrounds typically charge a fee for the privilege of camping there, to cover expenses. However, there are some in North America that do not charge a use fee and rely on such as donations. Staying the night in a big-box store parking lot is common, some RV parks provide year-round spaces. The Marchantiophyta /mɑːrˌkæntiˈɒfᵻtə/ are a division of non-vascular land plants commonly referred to as hepatics or liverworts. Like mosses and hornworts, they have a gametophyte-dominant life cycle and it is estimated that there are about 9000 species of liverworts. Some of the familiar species grow as a flattened leafless thallus. Leafy species can be distinguished from the apparently similar mosses on the basis of a number of features, leafy liverworts differ from most mosses in that their leaves never have a costa and may bear marginal cilia. Liverworts are typically small, usually from 2–20 mm wide with individual plants less than 10 cm long, certain species may cover large patches of ground, trees or any other reasonably firm substrate on which they occur. They are distributed globally in almost every habitat, most often in humid locations although there are desert. Some species can be a nuisance in shady greenhouses or a weed in gardens, most liverworts are small, usually from 2–20 millimetres wide with individual plants less than 10 centimetres long, so they are often overlooked. The most familiar liverworts consist of a prostrate, ribbon-like or branching structure called a thallus, liverworts can most reliably be distinguished from the apparently similar mosses by their single-celled rhizoids. Liverworts have a gametophyte-dominant life cycle, with the dependent on the gametophyte. Cells in a typical liverwort plant each contain only a set of genetic information. This contrasts sharply with the pattern exhibited by all animals. 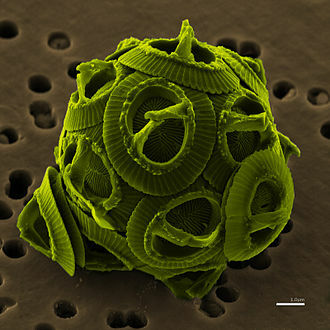 In the more familiar seed plants, the generation is represented only by the tiny pollen. Another unusual feature of the life cycle is that sporophytes are very short-lived. Even in other bryophytes, the sporophyte is persistent and disperses spores over an extended period, the life of a liverwort starts from the germination of a haploid spore to produce a protonema, which is either a mass of thread-like filaments or else a flattened thallus. The protonema is a stage in the life of a liverwort. The male organs are known as antheridia and produce the sperm cells, clusters of antheridia are enclosed by a protective layer of cells called the perigonium. The Rocky Mountain Trench, known as The Valley of a Thousand Peaks or simply the Trench, is a large valley in the northern part of the Rocky Mountains. The trench bottom is 3-16 km wide and ranges from 600-900 metres above sea level, the general orientation of the Trench is an almost uniform 150/330 degree geographic north vector and has become convenient for north/south aviators. Although some of its topography has been carved into glacial valleys, the Trench separates the Rocky Mountains on its east from the Columbia Mountains and the Cassiar Mountains on its west. It skirts part of the McGregor Plateau area of the Nechako Plateau sub-area of the Interior Plateau of British Columbia, the Trench is drained by four major river basins, the Columbia, Fraser and Liard. 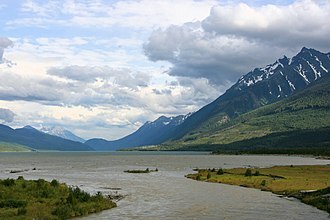 Two reservoirs of the Columbia River Treaty fill much of its length today - Lake Koocanusa, a further British Columbia power initiative created Lake Williston. The North Fork of the Flathead River, flowing into Flathead Lake with the branches of the Flathead River, is part of the Columbia River system. The Kechika is part of the Liard River system, and the Fox and Finlay Rivers, the Canoe River is a short tributary of the Columbia system, draining into Kinbasket Lake, a reservoir on the Columbia River. The Kootenai River, does not fully follow the Trench, the Kootenay River is a tributary of the Columbia, joining the Columbia at Castlegar, BC after a meander through the USA as the Kootenai River. For convenience the Rocky Mountain Trench may be divided into two sections, the Northern Rocky Mountain Trench and Southern Rocky Mountain Trench, the dividing point reflects the separation of north and easterly flows to the Arctic Ocean versus south and westerly flows to the Pacific Ocean. A break in the system at ~54°N near Prince George. The northern portion of the Trench is dominated by strike-slip faulting, the Tintina Trench extends further north-westward through the Yukon into Alaska. The visible expression of the two trenches is lost where they plunge under the boreal forests of the Liard Plain proximate to the communities of Watson Lake and Lower Post. Shaughnessy was born October 6,1853, at Milwaukee, Wisconsin. He was the son of Irish Catholics, Lieutenant Tom Shaughnessy, one of the shrewdest detectives and patrolmen in the early Milwaukee Police Department, and his wife Mary Kennedy. His father was born at Ashford, in Killeedy, County Limerick, Shaughnessy briefly attended the Spencerian Business College, but at the age of 16 went to work for the Milwaukee and St. Paul Railroad, first as a clerk, as a bookkeeper. In 1875 he became the adjutant of the 1st Regiment of the Wisconsin State Militia and that same year he was elected to the Milwaukee Common Council from the Third Ward, at that time heavily Irish-American. He was re-elected from 1875 through 1882, serving in the year as President of the Council. And briefly, in 1882, as its president, in 1880 William Cornelius Van Horne, the new general superintendent of what was now called the Milwaukee Road, appointed him as a purchasing agent. Shaughnessy arrived in Montreal in November 1882 to work for the Canadian Pacific Railway. He is described by E. A. James, Van Hornes private telegrapher, as a fashionably-dressed, alert young man, sporting a cane, the perpetually well-dressed perfectionist Shaughnessy became known for tight cost controls and a meticulous scrutiny of purchases and other expenditures. The Dictionary of Canadian Biography states, Shaughnessy had a pessimistic view of human nature. He was convinced that, given the opportunity, contractors, workers, everything had to be done in accordance with the many rules and regulations he introduced. He delighted in tracing even minor transgressions and publicly humiliating the perpetrators, Shaughnessy became CPRs assistant general manager in 1885, assistant president in September 1889, and in 1891 Shaughnessy became a director and vice-president of the railroad. He succeeded Van Horne as president in 1899, the CPR under Shaughnessy controlled the Consolidated Mining and Smelting Company of Canada and The Crows Nest Pass Railway. Under Shaughnessys administration, the CPRs mileage in western Canada almost doubled, the Canadian Northern Railway and the Grand Trunk Railway sought and often received subsidies in order to compete effectively with the politically-unpopular CPR. McGill University is a public research university in Montreal, Canada. It was established in 1821 by royal charter, issued by King George IV of Great Britain, the University bears the name of James McGill, a prominent Montreal merchant from Scotland whose bequest in 1813 formed the universitys precursor, McGill College. 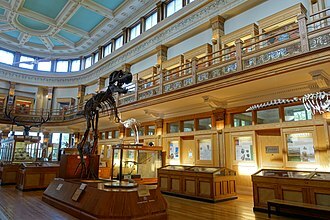 Its academic units are organized into 11 main Faculties and Schools, McGill offers degrees and diplomas in over 300 fields of study, with the highest average admission requirements of any Canadian university. Most students are enrolled in the five largest faculties, namely Arts, Medicine, tuition fees vary significantly between in-province, out-of-province, and international students, as well as between faculties. Scholarships are generous, yet highly competitive and relatively difficult to attain, throughout its long history, McGill alumni were instrumental in inventing or initially organizing football and ice hockey. In 1816 the RIAL was authorized to operate two new Royal Grammar Schools, in Quebec City and in Montreal and this was an important first step in the creation of nondenominational schools. When James McGill died in 1813 his bequest was administered by the RIAL, the original two Royal Grammar Schools closed in 1846 and by the mid-19th century the RIAL lost control of the other 82 grammar schools it had administered. Its sole remaining purpose was to administer the McGill bequest on behalf of the private college, since the revised Royal Charter of 1852, The Trustees of the RIAL comprise the Board of Governors of McGill University. James McGill, born in Glasgow, Scotland on 6 October 1744, was a merchant in Quebec. Between 1811 and 1813, he drew up a will leaving his Burnside estate, a 19-hectare tract of rural land and 10,000 pounds to the Royal Institution for the Advancement of Learning. 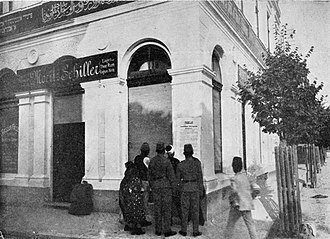 As a condition of the bequest, the land and funds had to be used for the establishment of a University or College, for the purposes of Education and the Advancement of Learning in the said Province. On March 31,1821, after protracted battles with the Desrivières family. The Charter provided that the College should be deemed and taken as a University, the Faculty of Medicine granted its first degree, a Doctor of Medicine and Surgery, in 1833, this was the first medical degree to be awarded in Canada. The British North American Exploring Expedition, commonly called the Palliser expedition and surveyed the open prairies and rugged wilderness of western Canada from 1857 to 1860. This was the first detailed and scientific survey of the region from Lake Superior to the passes of the Rocky Mountains. The expedition was led by John Palliser and they sailed from Sault Ste Marie by steamship across Lake Superior. On June 12, they continued in canoes from Isle Royale, the expedition continued with horses and carts, with supplies provided by the Hudsons Bay Company. They continued via the Red River and across the prairies and they met Charles W. Iddings, an American surveyor, along the United States border. In the spring they marched west, and searched for mountain crossings west of modern-day Irricana and Sullivan mapped the North Kananaskis Pass and North Kootenay Pass before returning to Fort Edmonton for the winter. Hector crossed the Vermilion Pass and discovered the Kicking Horse Pass, during the winter, Captain Arthur Brisco and William Roland Mitchell went south to Rocky Mountain House to meet the Blackfoot and Northern Peigan First Nations. In 1859, the expedition mapped the confluence of the Red Deer River and South Saskatchewan River, as well as the Cypress Hills, Hector crossed the Rockies through the Howse Pass, and tried unsuccessfully to push through to the Pacific Coast. Sullivan explored the Columbia River and its tributaries as far west as the Okanogan Valley, while Palliser crossed over land to Midway, unable to find passes to the Pacific north of the 49th Parallel, they reunited with Hector in Fort Colville. From there, they traveled 598 miles downstream on the Columbia River to Fort Vancouver, the expedition returned to the East Coast by ship through San Francisco and Panama, to Montreal. From there, they sailed back to Liverpool. After three years of publishing details of the expedition, Palliser presented his report to the British Parliament in 1863, a comprehensive map of the surveyed areas was published in 1865. Pallisers Triangle was first explored by this expedition and they reported to the government that this region was too arid for subsistence agriculture, a finding that was overruled by officials. The Kootenay is a major river in southeastern British Columbia and northern parts of the U. S. states of Montana and Idaho. 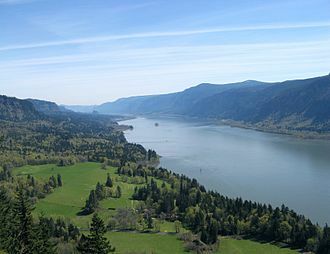 It is one of the uppermost major tributaries of the Columbia River, born in glaciers and flowing through a rugged landscape of mountains and valleys, the river drains an isolated and sparsely populated region of the Pacific Northwest. From its highest headwaters to its confluence with the Columbia River, people of the Ktunaxa tribe were the first to live along its banks, and for hundreds of years, they hunted and fished on the river, quite isolated from neighboring indigenous groups. In the 19th century, a Canadian explorer, David Thompson, became the first recorded European to reach the Kootenay, as with many Pacific Northwest rivers, dams were built on the Kootenay in the 20th century to generate hydroelectricity, and protect against floods and droughts. The river was described with different names by two groups of the local Ktunaxa Indian tribes. These indigenous people who lived along the upper river knew it as aqkinmiluk, the people along the lower river called it aqkoktlaqatl, a name whose meaning is not certain. The name Flatbow River comes from the name the Blackfeet used to call the Ktunaxa, for their powerful, stylish bows, thence he applied the name McGillivray’s River to the real Kootenay in honor of his trading partners William and Duncan McGillivray. In his writings, the Columbia from Columbia Lake to the Big Bend was actually called the Kootenae, the name Kootenai was used by French Canadians to refer to the Ktunaxa in the 19th century. Kootenai is thought to be a word meaning water people in an Algonquian language and these include Kootanie and Kootienay. The Geographic Names Information System of the USGS lists Swan River as a name although the origin of this name is uncertain. The Kootenay rises on the northeast slopes of the Beaverfoot Range of southeastern British Columbia and its first few kilometers are quiet, threading slowly through a series of marshes and small lakes. The river becomes significantly enlarged as it reaches the confluence with the Vermilion River and it continues southeast, receiving the Palliser River from the left, and swings southwards into a gorge at the confluence with the White River. Radium is a chemical element with symbol Ra and atomic number 88. It is the element in group 2 of the periodic table. Pure radium is silvery-white, but it combines with nitrogen on exposure to air. All isotopes of radium are highly radioactive, with the most stable isotope being radium-226, when radium decays, ionizing radiation is a product, which can excite fluorescent chemicals and cause radioluminescence. Radium, in the form of chloride, was discovered by Marie. They extracted the radium compound from uraninite and published the discovery at the French Academy of Sciences five days later, Radium was isolated in its metallic state by Marie Curie and André-Louis Debierne through the electrolysis of radium chloride in 1911. In nature, radium is found in uranium and thorium ores in trace amounts as small as a seventh of a gram per ton of uraninite. Radium is not necessary for living organisms, and adverse effects are likely when it is incorporated into biochemical processes because of its radioactivity. Today, these applications are no longer in vogue because radiums toxicity has since become known. Radium is the heaviest known alkaline earth metal and is the only member of its group. Its physical and chemical properties most closely resemble its lighter congener barium, pure radium is a volatile silvery-white metal, although its lighter congeners calcium and barium have a slight yellow tint. 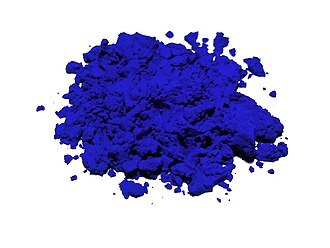 Its color rapidly vanishes in air, yielding a layer of radium nitride. Its melting point is either 700 °C or 960 °C and its point is 1,737 °C. Both of these values are lower than those of barium. Like barium and the metals, radium crystallizes in the body-centered cubic structure at standard temperature and pressure. 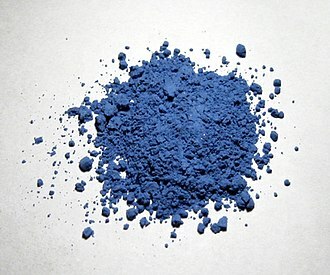 Radium has a density of 5, like barium, is a highly reactive metal and always exhibits its group oxidation state of +2. It forms the colorless Ra2+ cation in aqueous solution, which is highly basic, the values for barium and radium are almost exactly the same as those of the heavier alkali metals potassium and caesium. His extensive travels as a missionary were said to total 180,000 miles. He was known as the Friend of Sitting Bull, because he persuaded the Sioux war chief to participate in negotiations with the United States government for the 1868 Treaty of Fort Laramie, part of the complex survives today as Sacred Heart Church in Bowie. De Smet moved west to St. Louis to complete his studies in 1823. De Smet and five other Belgian novices, led by Charles Van Quickenborne, moved to Florissant, several academic institutions were immediately founded, among which the St. Regis Seminary where De Smet had his first contacts with indigenous boys. After further studies, he was ordained priest on 23 September 1827, until 1830, he learned about Indian customs and languages as a prefect at the seminary. In 1833 he had to return to Belgium due to health problems and it was 1837 before he could return to Missouri. In 1838 and 1839, De Smet helped to establish St. Josephs Mission in what is now Council Bluffs, taking over the abandoned Council Bluffs Blockhouse military fort, De Smet worked primarily with a Potawatomi band led by Billy Caldwell, known as Sauganash. De Smet was appalled by the murders and brutality resulting from the whiskey trade, during this time, he assisted and supported Joseph Nicollet’s efforts at mapping the Upper Midwest. De Smet used newly acquired mapping skills to produce the first detailed map of the Missouri River valley system and his map shows the locations of Indian villages and other cultural features, including the wreck of the Steamboat Pirate. Louis to request black-robes to be sent among them to baptize their children, the first three delegations failed due to disease and massacre, while passing through the Territory of the Sioux, but the fourth was successful. Fr. de Smet was assigned to accompany the messengers back to the Indian territory, to ascertain the nation and establish a mission among them. On 5 July 1840, Father De Smet offered the first Holy Mass in Wyoming, a mile east of Daniel, a monument to the event stands on its site. In 1841, St. Marys Mission was founded among the Salish by De Smet and he noted the proselytising of the American Board of Commissioners for Foreign Missions under Henry H.
The large herds of cattle owned by Californios in Alta California and the products derived from the animals were popular trade goods. This later helped convince the HBC to establish their own livestock venture on the Pacific Coast. Modern Oak Harbor on Whidbey Island, an island deemed suitable by the HBC for the PSAC. In 1875, the North-West Mounted Police erected Fort Calgary in an effort to police the area. 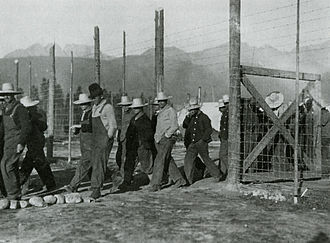 Rounding up cattle for the first Calgary Stampede in 1912. The Stampede is one of the world's largest rodeos. From 1971, the population of Calgary rose significantly, with many high-rises constructed to accommodate the growth. Located east of downtown Calgary, Inglewood is one of the city's oldest residential neighbourhoods. The hot-water pool at Radium Hot Springs. Glass tube of radium chloride kept by the US Bureau of Standards that served as the primary standard of radioactivity for the United States in 1927. Self-luminous white paint which contains radium on the face and hand of an old clock.